How Can a Food Psychology Approach Help? Our food choices are influenced by our thoughts, feelings, emotional well-being and early experiences. Weight gain often occurs when an individual tries to find comfort in food or uses food to deal with stress or trauma in the past. Food is rarely just about eating in response to physical hunger. The Food Psychology Academy courses reveal the 30+ reasons why we eat, and why hunger is often the least important one! Yet despite this, most of our traditional approaches to weight management assume that we are eating in response to physical hunger. To change the way we eat, it’s essential to address ‘psychological hunger’ as well as physical hunger. Why Is ‘Healthy Eating’ Unsustainable For Some? Most people can follow a healthy eating plan in the short-term and some can maintain this way of life in the long-term. To do this, they have been able to adjust their internal drivers for food without needing assistance. However just like we all have varying levels of support needs when we learn new skills (such as driving a car or learning a new language), we each have different needs when it comes to developing the psychological skills necessary to manage our food habits. If you’re struggling to adopt a healthy way of life in the long term, it’s likely you need some extra support. To change certain habits, you simply need to understand why the habit began (the purpose it served) and how it can be altered for good. The Food Psychology Academy training guides you with simple, step-by-step processes to support you to understand why you have developed your food-related habits AND what to do to change these for long-term transformation. 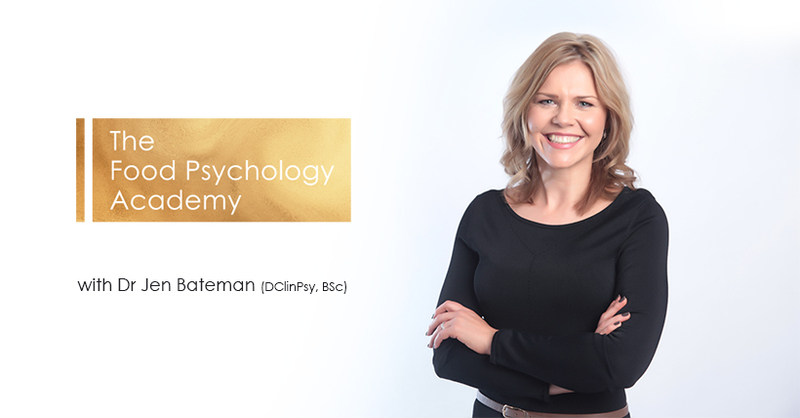 How Does The Food Psychology Academy Support Individuals & Professionals? The Food Psychology Academy Training teaches a range of psychological approaches to access both the conscious and unconscious drivers for eating, in a step-by-step way that is perfect for those without any psychology background. The step-by-step training courses are based on evidence-based psychological models including cognitive-behavioural, mindfulness, psychodynamic, solution-focused, attachment models and more. Whilst firmly based on psychological principles, training courses are also very accessible and jargon-free, using down-to-earth, everyday language to explain practical, ‘how-to’ solutions. You can rest assured you are in safe hands - Dr Jen has been named an ‘Outstanding Educator’ for her ability to simplify the complex!